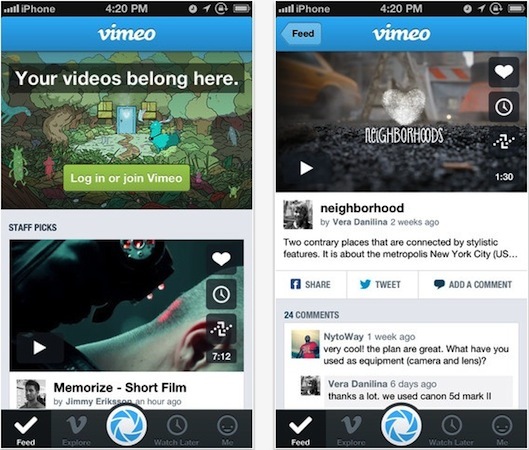 It's been nearly a year since Vimeo proudly went universal on iOS, and today the video service has rolled out its application's third major installment. Inside version 3.0, the iOS folk will find a redesigned app with a brand new "tab-based" design and a novel Feed video browser. That's not all, however, as Vimeo's also added the ability to natively share to both Twitter and Facebook, the option to manage vids on the Watch Later queue and a trait which lets users take advantage of background uploads. While most of today's release is filled with an array of video-friendly goods, some iOS users will be disappointed to hear that this new version nixes the editor feature -- however, according to Vimeo, "active" projects can still be downloaded and saved to the Camera Roll app. Those of you interested in checking it out can hit the link below to grab the updated app.